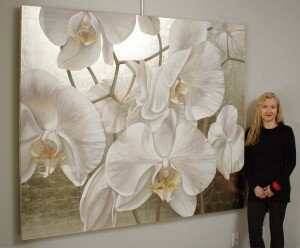 The following guest post is an interview with Ilona Biernot, orchid enthusiast and painter. 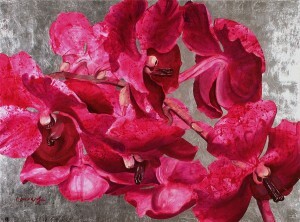 She is an artist who paints gorgeous orchid portraits. Be sure to check out her painting gallery. You won’t be sorry you did! Ryan: How long have you been an orchid collector? How did your Painted Orchid Series come about? Ilona: I became an avid orchid collector over 20 years ago. My first orchid was a white Phalaenopsis that used to bloom every year for 10 years. Each year, it had 30 to 40 flowers. When it died, I missed the white beauty, and while looking for a replacement for it, I became aware there are many different types of orchids. I began to collect them, and my sunroom became a mysterious garden admired by many. Surprisingly, they all grew and bloomed, much to the envy of my friends. It was then when I decided to preserve their beauty on canvas. Fascinated by their colours and shapes, not only did I start to collect them, but I began to experiment with how to capture their delicate and seductive shape on canvas. Ryan: What do you enjoy most about painting Orchids? Ilona: As a portrait artist, I look at orchids like I look at people’s faces; they have a distinct shape and unique characteristics. They also have very distinct personalities; some might be moody while others appreciate your friendship. 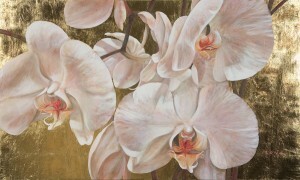 Ryan: Can you describe the techniques and materials you use in your orchid paintings? Ilona: Using different kinds of paint to get the right shade of colour and brightness, I decided to decorate the background with leaf metal that would make the shape of the flower stand out, and give the painting an inner light and life. 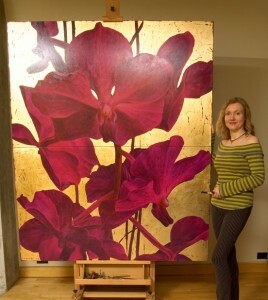 I use rather large canvases for my compositions and very often genuine silver or gold leaf to illuminate the flowers. Ryan: Is your artwork available for sale? Where can our readers go to see your available paintings and purchase them? Ilona: My paintings can be seen in Canada at the Articsok Gallery in Toronto and Towne Square Gallery in Oakville, ON; they have admirers in many countries in Europe. They also adorn many houses of my private clients in the US. Ryan: Do you personally grow orchids? How many do you have? Where do you grow them? Ilona: I still grow my own orchids; they like to be petted and talked to. I think the secret to my success is that they enjoy listening to operatic arias, so I started to call them by names of opera titles or their heroines. Ilona: My favorite orchid is a purple Cattleya with a large velvety flower. She looks like a dramatic, possessive Tosca. I interpreted its character many times on canvas giving its centre yellow stripes of jealousy or red shades of passion. Ilona Biernot is a portrait artist presently residing in Toronto, Ontario. She breathes life into two dimensional floral compositions finding power and sensuality in the discarded and the delicate. You are invited to enter this world, and by chance catch a fleeting glimpse of that which might be a reflection from within. The mystical beauty of an orchid and its sensuality awakes the senses making the compositions gardens of pleasure. 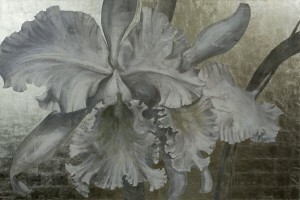 View samples of her orchid paintings here.